Associate Professor Dr. Che Wan Zanariah Che Wan Ngah, who used to work in the industry in the early 1990s as a chemist, now holds a position as the Director at the Institute of Halal Research and Management (IHRAM), Universiti Sains Islam Malaysia (USIM). As someone who has been interested in the field of chemistry since school, she takes her appointment beginning January 2017 positively so as to enhance the role of IHRAM in disseminating knowledge of halal consumerism with 10 staff. Q1 How do you see this appointment as a challenge for female to lead a research institution especially in halal aspects? I have served as an instructor in USIM for almost 10 years and when given the trust to shoulder this role in management and administration, I consider it as a challenge and amanah that must be carried out especially in the dissemination of information on the Halal Consumerism Education in the community. I have no problem with it because I am very interested in the field of research and halal management because for me it is a charity to utilize the existing knowledge. At the same time, it is my responsibility to ensure that Islamic consumers are confident in using high standards of halal and toyyiban products and do not take it easy on the purity of food in daily food intake. Q2 How do you look at the prospect of IHRAM in helping USIM to improve the niche area in relation to research and development? 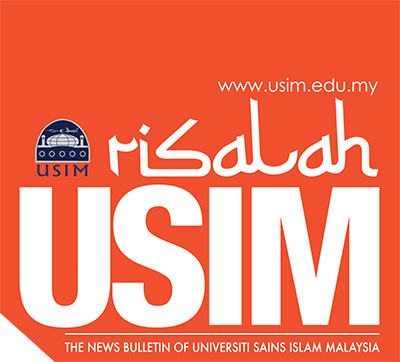 With full support and cooperation from all levels in USIM, IHRAM is committed to becoming a halal consumerism education reference center that is capable of producing innovative research, laboratory services that comply with standard operating procedures and offering comprehensive training programs. At the same time, IHRAM has always intensified joint efforts towards integrating Naqli and Aqli knowledge into halal consumerism education so as to produce added value to the nation and the ummah. Q3 What is the strategy for strengthening the role of IHRAM as well as to ensure that this halal consumerism education continues in the future? Since childhood my parents have often reminded me of the responsibility to observe my solat and watch what I eat. From there, I always relate their advice about responsibilities to IHRAM staff which can be interpreted as to how important it is to ensure that the source of our stomach is from halal-guaranteed and toyyib products. Therefore, it is an important mission for me to continue to guide and work with the staff to strengthen the role of IHRAM in spreading the knowledge of halal consumerism from the industry to the consumers in ensuring the validity of the source that meets the halal and toyyib concept. Q4 So far how successful is the strategic cooperation between the university and local and foreign parties in promoting this halal aspect? In the aspect of strategic cooperation between the university and industry, so far at the national level IHRAM has worked with Jabatan Kemajuan Islam Malaysia (JAKIM), Jabatan Standards Malaysia, Universiti Malaysia Sabah, Jabatan Agama Islam Selangor, Konsortium Institut Halal IPTA Malaysia (KIHIM), Jabatan Hal Ehwal Agama Islam Negeri Sembilan (JHEAINS), QSR Brands (M) Holdings Sdn Bhd, Gerbang Alaf Restaurants Sdn Bhd and Mamee Double Decker Sdn. Bhd. While at the international level, IHRAM has worked with Japan Halal Research Institute for Products and Services (JAHARI), Sejong Cyber University, Korea Media Tourism Research Center (KMTRC) and Mindanao State University (MSU) -Maguindanao -Philippines. Q5 What are the challenges that IHRAM has to handle and what are the efforts or solutions taken to solve them? The main challenge is limited research funds as well as the lack of research equipment. Therefore, the approach taken is through the application of more research grants. What can I say is that in conducting a halal research, we should put a goal so that the process of delivering knowledge or information on halal and halal issues can be channeled to the society effectively.